Celebrating over 12 years of service in Buffalo! 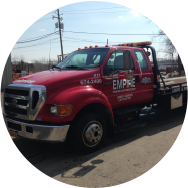 Empire Towing & Recovery is your local connection for Towing Services in Buffalo NY. Specializing in light and medium duty flatbed and wrecker service. Our towing service is available 24 hours to provide service when you need it most.Talk to a dispatcher, not an answering service. We are centrally located near route 20 and highway 400 and we use GPS tracking to get to you sooner. Teamwork, reliability, communication, and skill are the foundation of our commitment to exceptional customer service. 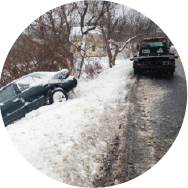 24/7 Towing services for Western New York. Accidents, breakdowns, winch outs, roadside assistance, we can help. 8 point tie down systems, fabric straps, and experience drivers to assist with all of your flatbed towing and transport needs. 2 Trucks with a 4 car capacity, running 2 trips daily. Ask us about trips to Syracuse and as well. 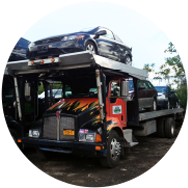 Repair shops, dealerships, fleets, and auction companies, contact us for your towing and vehicle transport needs. “Quick to respond and very professional”– Peter, Jim Ball Service Dept. It’s hard to trust a towing company when all you have is a web page and a business card. That is why we encourage our customers to rate our services. HOW DID WE DO? LET US KNOW. 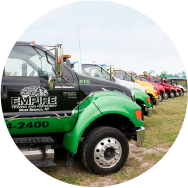 LOOKING FOR EMPIRE EQUIPMENT RENTAL?